First let’s discuss the ashtray. This (below) is the general context of the interior, the 1994-2001 E38 7-series, designed partly under Claus Luthe and mostly under the regime of Wolfgang Reitzle. While the main interior photo is stock, Mick’s car’s interior has the same architecture. Notice, please, the location of the ashtray. So looking closer again at the ashtray, one finds that the design of the icons for the ashstray are not down to the whim of a well-paid designer. The ISO system has a set of approved icons for automotive controls. That would also include the cigar lighter symbol. And it also includes the warning triangle symbol on a button situated somewhat eccentrically right by the ashtray, and almost flush with the surrounding surface. No ergonomic marks for that, Mr Reitzle. Not flush is the plastic indentation on the ashtray lid, where you press the panel to open it. This is an example of affordance, design to show function. It’s all laid out with a careful neatness, mark you, and rather nicely finished. The use of the ISO icon indicates an impressive level of seriousness. But then again it is a serious car and always has been. You will notice that like many German cars of the time, the ashtray is in front of the gear selector and it is very broad, generous affair, designed for the chap working his way through two packs of Davidoff cigarettes en route from Heidelberg to Flensburg. There is also room for a passenger’s ash. So, from 1977 to 1994 the 7-series driver’s ashtray sat in front of the gear selector and then the world turned upside down when it was moved to being behind the gear-selector. In the transition it went from being a lower-hinged drawer (E-23) to a pull-out drawer (E-32) to a flip-open lidded ash-receptacle (E-38). People think Bangle started the revolution at BMW with the E-65 but it began in 1994, with that ashtray being relocated. With such a change anything was possible, a slippery path to iDrive and flame surfacing. Now, can you please put down what you are doing and look at the ashtray in the 1976 car again. It has what looks like a solid wood cover. That’s the sort of carpenty you find on 60s Scandinavian furniture. Notice also the sheer consistency of BMW’s interior layouts (ashtrays notwithstanding) over three generations. Apart from being confused about where to put the ash, the driver of the E-23 and E-32 would be familiar with the general look of the interior of the E-38 too. It says, politely and clearly this is a BMW. And not another type of car such as, say, a Mercedes. Claus Luthe and one of his earlier cars. Why did BMW break with tradition for the E-38’s ashtray? BMW moved the ashtray in part because of the growing demand for dashboard real estate made by the buttons needed for other functions. The E-38 has a small screen, well-integrated and not that easy to see while driving. You can relate the evicted ashstray then to the nascent steps towards connnectivity that began in the middle-1990s. The E-32 is the last of the buttons buttons buttons cars; for the E-38, BMW already sensed that more functionality had to be added. Being an ultimate driving machine did not cut it with some customers. Now that I come to think of it, we can revise the story of the evolution of car interiors to say this: that the decline of cigar smoking led to a need for smaller ashtrays. That in turn freed up space for more buttons and controls. That in turn led to the possibility of screens being added to the interiors to facilitate in-car satellite navigation devices. As well as dabbing the ashtray I had a short stint behind the wheel. Yet again I have to roll my eyes theatrically about the state of contemporary cars. The E-38 is by no means a small car. And it’s not a limousine but an expression of the sport saloon. Yet. Yet. Yet: after about two minutes I felt I knew where the corners were and noticed there was nothing at all bulky about the car which is, in fact, properly large. This is an impressive achievement, to make a full-size saloon feel as well fitted as a tailored suit. Typically driving any new car is (I find) accompanied by a faintly claustrophobic sense of not seeing everything around you and a feeling of proprioceptive insecurity. Having driven some large American cars I can say they too have a muffling sensation too. And coming up to date, a recent drive in the E-38’s descendent the F-01/F-04 also produced a worrying sense of unknown mass around me. Nice car, it has to be said and I soon got used to the F-01’s sheer width. It is not a sports saloon though and the E-38 definitely is, with a clear sense that it is simply more of the same thing the contemporary 3-series is made of (in the best sense). I simply did not expect the E-38 to feel so easy to place. If the ashtray of the E-38 is just about okay, the rest of the car stands as a big question mark over where large cars are going right now (I am talking about manageability). They aren’t doing anything like this today. Richard, access to the ashtray can be made even more difficult by simply extending the armrest. It almost totally covers it. If I was still a smoker it would annoy me. A lot. There may have been a calculation that anyone who wanted to thoroughly rest their arm might not want to smoke at the same time. That’s bogus since I have often leaned on my own car’s centre armrest with a cigar on the go. It is a small problem since the rest of the car is so good. BMW have lost the sport saloon feeling. They make European Buicks. A person who is smoking a cigar whilst driving can be said to be in a relaxed frame of mind (or, at least, trying to remain calm). Therefore it is natural that arm rest and ash tray should both be available for use at the same time. Ash tray placement inconsistencies aside, this was surely the high point of BMW interior design. My old E39 followed the same principles – a simply delightful driving environment, with good ergonomics and pleasing aesthetics. These cabins (as well as the E46’s) have stood the test of time rather well. As someone who knows the E38 rather well, I can add another reason as to why the ashtray had to leave the dashboard: beverage cup holders. Early E38s usually weren’t equipped with the satnav that would later on take up much dashboard real estate, but each and every post-’94 Seven had a mechanically elegant cup holder in roughly the same location as E32’s ashtray. Soft drinks taking the place of fags: this was the ’90s! Regarding the hazard lights button, I can report that all BMWs had it in roughly the same spot, so flush or proud, any BMW driver would’ve known where to put his hand and push, if needs be. This is a similar solution to Mercedes multifunctional stalk, whose operation was bewildering to rental car drivers, yet utterly instinctive to Mercedes owners. As much as I’m an E32 fan, I must stress (yet again) that the ’38s cabin was simply a triumph of ergonomics, ambience and perceived quality. Some of the examples of the breed I experienced were far from fault-free in terms of quality and reliability, but the interior was always a very pleasant place to spend time in. Mind you, it was and still is a heavy beast of a car, though that wasn’t obvious when piloting the rather wonderful 750i. That car’s 5.4 litre V12 finally delivered on the promise the earlier, rather lacklustre 5.0 litre engine had made. 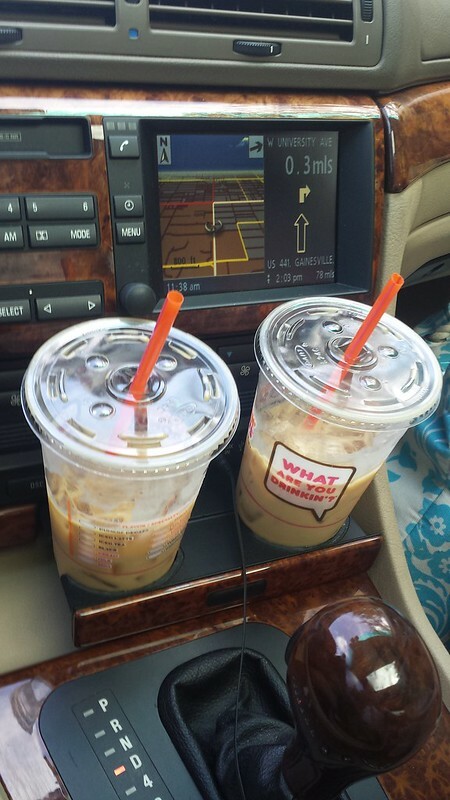 Cupholders. These are pandering to non-European markets that lack Stelvio Passes and Routes Napoleon. You can’t drink Dr Pepper when doing serious wheel-steering. Those cupholders are not deep enough. Maybe they might work if the car is parked up outside the arrivals area at Frankfurt. Once the car is tackling the ´Ring all that coffee will be soaking into the footwell carpet or running down the insides of the sideglass. The dual disappearance of ashtrays and the appearance of cupholders say/s alot about the changing way we use motor-cars, how we engage with them. Even when I am driving in my customary languid manner, I keep both hands on the wheel as much possible. Unless it´s a Toyota Auris: then I keep one arm cool by dangling it out the window. The front cup holders are perfect for a standard takeaway coffee cup. They hold the cup firmly even whilst cornering quickly. The rear pair are a lovely looking piece of engineering but you couldn’t trust them nearly as much. Mick: I hope the ash was even better secured during energetic driving. I am a little surprised you say they work so well. They look so shallow. They work very well indeed, for they truly grip the cup. Not a single drop was spilled in my time, even during prolonged stretches of 200kph, erm, ‘cruising’ (I wasn’t behind the wheel). That E-23 interior is lovely. I seem to have a real soft spot for late 1970s BMW ergonomics. It didn’t resemble other cars’ approach. Saab and Citroen also ploughed their own furrows. The E-23 has quite a strongly expressive look; the main forms have a few more degrees off vertical/horizontal than is necessary. Returning briefly to my Ford Sierra obsession: the interior brief was apparently to “make the driver feel important”. It’s easy to imagine the designers thinking about driver’s cars, thinking about BMWs and thinking about angled dashboards. The Sierra’s dashboard owes a clear debt of gratitude to BMW’s earlier ergonomic work. I also read once that BMWs used to have a feature whereby all instrument needles would be pointing at twelve o’clock if travelling at a certain speed (100 km/h?) so the driver could easily tell if something was amiss. None of which is about ashtrays. The Sierra still stands out as a good example of the driver-orientated dashboard. At the other extreme is the old-school American plank of plastic and Timberlex with the horizontal speedo. Are today´s dashboards particularly driver-orientated? They seem designed to make work for CAD modellers more than anything. Zaha Hadid´s building were influenced by and in turn influenced car interiors. BMW these days have a thing about shapes that look like muscle and tendons, with layers crossing over each other. Maybe in a decade I will appreciate them. And no, that comment wasn´t about ashtrays. It is still welcome. 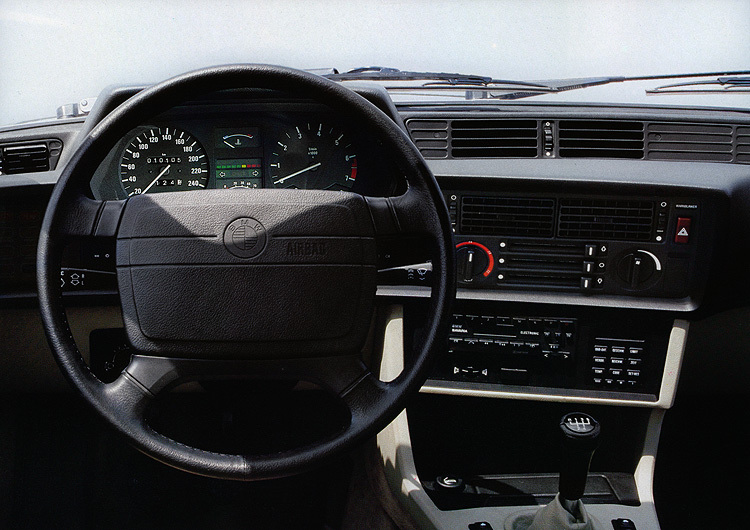 I never cared much about car ashtrays (back in my smoking days I never used them), but I’ve long been curious about the steering wheel on the picture of the E32. It always struck me as an afterthought/stopgap jobbie, presumably to allow for the rollout of airbags on models not designed to have them at the time of launch. Does anybody know if it was an off-the-shelf item from a supplier, or if anyone at BMW ever owned-up to designing it? Where did you put the ash and cigarette butts? The E-32 steering wheels seems to be an evolution of the E-23´s. It´s not especially awful. I thought Jaguar´s first airbag steering wheels very much worse. Citroen offered a repulsive two-spoke effort on diesel XMs and also for the UK market where the single spoker was considered way to scary for customers. For cigarette butts and ashes there was always an open window back in those days. As for the E32 wheel, it’s not especially awful but it looks more Merc-Benz than BMW to me. Laurent: how very Archie Vicar. I am pretty sure that is an early airbag-equipped wheel. At first, they couldn’t work out how to fit a shiny badge on the airbag cover. Ferrari’s earliest attempts at airbag-equipped steering wheels where ghastly… especially compared to the delicious Momo wheels which came before. These airbag steering wheels were a hideously expensive option at first and were usually only found inside the 750i(L) model. With the mid-life facelift and the introduction of V8 engines, double airbags became standard equipment, but the design remained the same. The development in size of steering wheels with airbags is largely technology driven. Initially the capsule containing the explosive was very big because sodium acide (the same explosive as in hand grenades from WW I) was used which is extremely hygroscopic and will ignite itself when wet and therefore needs very special containers. With new explosives the gas generator capsules got ever smaller and would fit in smaller wheels. The airbag itself initially was very large and made from thick material which needed lots of talcum powder to prevent it from sticking together. The biggest breakthrough came when Fiat raided the technology archives of their aero and medical subsidiaries for anything useful in cars. They found a fabric used in dialysis machines that was ideally suited for airbags. That material was much thinner than the usual stuff and could be folded with much smaller radii and therefore enabled the wheels of e.g. the Fiat barchetta to be so small. With all the worlds troubles and my day spent in a hot room listening to guff, it is most soothing to come home and delve in to such topics. Thank you indeed. This is the kind of reaction that makes running DTW such a pleasure. I regret to inform the readership of DTW of the demise of the cupholders (front and rear) of the above car.